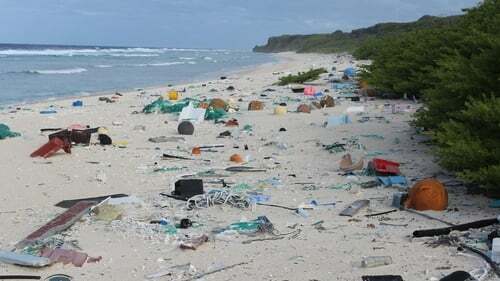 Plastic litter piles up on remote South Pacific island. One of the planet's most remote islands is polluted with the highest density of plastic particles ever reported, with more than 3,500 pieces washing up daily, according to researchers. Henderson Island is uninhabited, and lies far out in the South Pacific - east of New Zealand and west of Chile - some 5,000km from the nearest major land mass. This 9,100 acre limestone atoll, one of the UK's Pitcairn Islands - is prized for its biodiversity. But it is also littered with an estimated 37.7 million pieces of plastic, said the report in the Proceedings of the National Academy of Sciences, a peer-reviewed US journal. "Its location near the centre of the South Pacific Gyre ocean current makes it a focal point for debris carried from South America or deposited by fishing boats," said the report. "We estimated a minimum of 3,570 debris items were deposited on North Beach daily, five orders of magnitude greater than the accumulation rates reported elsewhere." About 27% of the items were identifiable as being from South America, including beach equipment and fishing gear. The island is so remote that it is visited only once every five to ten years for research purposes. It was during the most recent scientific expedition to the island in 2015 that researchers discovered the extent of the pollution problem. The beaches were found to be littered with between 21 and 671 items per square metre, said researchers at the Institute for Marine and Antarctic Studies (IMAS) at the University of Tasmania and the British conservation charity the Royal Society for the Preservation of Birds.